Li Songsong is an artist caught between past and future. Born in 1973 at the tail end of the Cultural Revolution, he is not part of the generation of artists who came of age in the upheavals of that time and first emerged in the early 1990s. Yet, as the son of a prestigious military family who vividly recalls the death of Mao and Zhou Enlai as his earliest childhood memories, he is certainly not one of the younger generation of Chinese artists whose only recollections are of China’s big boom as a global economy. Like many his age, he struggles with the uncertainty of identity, unsure what he is supposed to remember, unclear what he is supposed to forget. What differentiates Li Songsong from so many of his peers, is the way that he is struck by pictures of events and places of a past that he had only a tangential part of, yet he cannot deny their resonance. 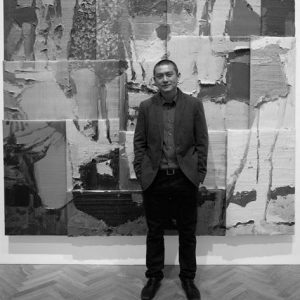 He grew up in Beijing and attended both the secondary school and college of the Central Academy of Fine Arts (both located in his hometown), yet his influences are wide-ranging, and include many European and American artists. He is cosmopolitan as he speaks about his work with an almost shy, self-effacing manner. At the same time, he wields a brush with total confidence, layering paint and then scraping its surface, as if he is both burying and uncovering memories. These are the contradictions that make him such a unique figure and contribute to a painting style that is as intriguing to see as it is challenging to analyze. All of his paintings start with a photographic image that he finds in books, magazines, archives, film stills or the internet, often alternating between pictures of historic significance with those that are purely personal and idiosyncratic. His intention is not to illuminate the original source or didactically reduce it to an iconic symbol, but to use this as a starting point in a process that veers towards abstraction. 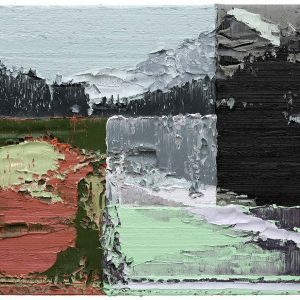 Li Songsong repeatedly told me when we met in his studio—it was fantastic to see his palettes laden with mounds of color as thick as scoops of gelato—that he takes an objective stance towards his source material, which I interpreted to mean that he is neutral, neither nostalgic nor critical. But, Li Songsong is unquestionably drawn to certain kinds of images, those tinged with violence and a certain quality of amorality, that he returns to over and over again.